Applying for a permit? Check a property for expired permits. Before a new building or trade permit application will be accepted or approved, expired permits of the types listed below must be resolved. If the old work is related to a new scope of work within the same structure, it is strongly recommended that the expired work be re-permitted with the new permit application. 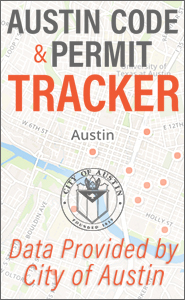 You will need to indicate the intent to resolve the expired permit under the “project description” of the new application. For questions about resolving expired permits, please call 512-978-4000. Note: Permits expire on the 181st day after the date the permit is issued and the project has not received an inspection, or after the date of the last inspection that shows progress toward completion of the project. An application for a permit will be deemed “Expired” after 180 days if a permit has not been issued.